Holiday House in Tuscany near the Etruscan Coast . The house is situated in an idyllic location in the heart of the Val di Cecina in the province of Pisa , and enjoys a spectacular view over the hills from Volterra lead to the Tyrrhenian Sea . At about 2 km there is the medieval castle now a small hamlet inhabited by few people . The village is a jewel of the Etruscan coast , frequented by tourists in the summer thanks to exhibitions and concerts held in the picturesque main square . 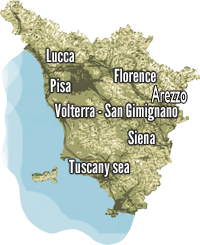 At 25 km you can visit the majestic ancient Etruscan town of Volterra and about 22 km you will find the beaches of the Etruscan Coast . The house is situated in a place of absolute peace and silence , surrounded by vineyards and wheat fields . The house has a gazebo for outdoor dining and a small above ground pool . The house and the pool can be rented for exclusive use . Inside the small’Borgo‘ where you can enjoy a traditional Tuscan dishes and local products . The house is the ideal accommodation for families and friends who want to spend their holidays at sea without sacrificing the peace and relaxation that Tuscany has to offer. Price included:towels, bed linen, outdoor swimming pool 7m depth 1,5 (opening may-september), parking, final cleaning, utilities.